Campers love the national parks. Since 1916, when the National Park Service was created, the United States has preserved wilderness areas within a system overseen by the US Department of the Interior. National parks are popular destinations for outdoor recreation and provide spectacular camping locations. Each US National Park offers scenic nature and a rugged, natural environment. We asked which are your favorite national parks for camping and these five stood out from the rest: Glacier, Grand Canyon, Great Smoky Mountains, Yellowstone and Yosemite. Montana's Glacier National Park is a camper's paradise. Glacier is well known for its natural beauty and there are numerous options for sightseeing, camping and adventures. Known to Native Americans as the "Shining Mountains" and the "Backbone of the World," Glacier National Park is named for its prominent glacier carved terrain. More than 700-miles of trail lead adventurous hikers through pristine wilderness, alpine meadows, rugged mountains and alpine lakes. The Park preserves more than one million acres of forests, peaks and glacial-carved valleys in the Northern Rocky Mountains and is home to 70 species of mammals and 270 species of birds. Glacier offers 13 campgrounds with more than 1,000 campsites. Pets are allowed in campgrounds, but are not allowed on any park trails. 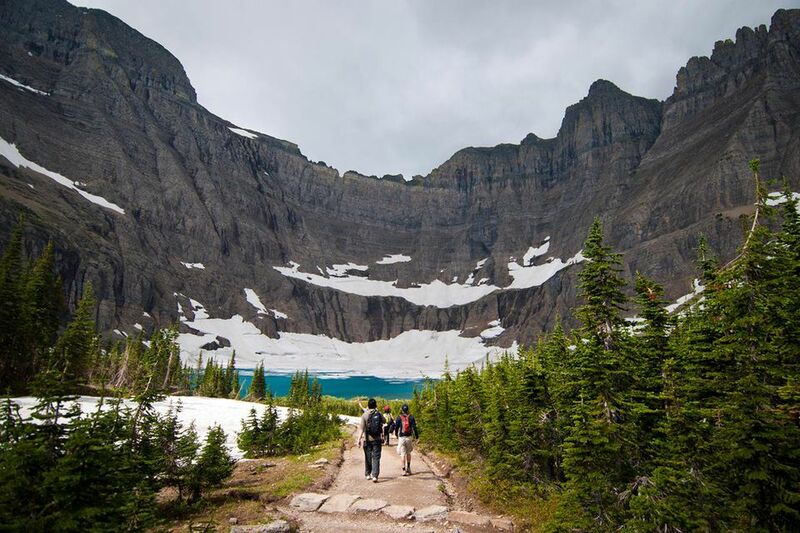 About Camping readers voted Glacier National Park their favorite for camping. Grand Canyon National Park encompasses 1,218,375 acres and lies on the Colorado Plateau in northwestern Arizona. It is a World Heritage Site. The Grand Canyon is one of the most studied geologic landscapes in the world for good reason. The Canyon, eroded by Colorado River, averages 4,000 feet deep for its entire 277 miles. At its deepest point, the canyon is 6,000 feet deep and measures 15 miles across at its widest point. The gorge shows off 2 million years of geology as the Colorado plateau was lifting. But the Grand Canyon is not just limited to geologic wonder. Over 1,500 plant species, 355 birds, 89 mammals, 47 reptiles, 9 amphibians, and 17 fish species are found in Grand Canyon National Park. Campground reservations can be made at two campgrounds in the park - one on each side of the rim: the Mather Campground on the South Rim in Grand Canyon Village, and the North Rim Campground. Great Smoky Mountains National Park is one of the most diverse parks in North America. The park was designated an International Biosphere Reserve by the United Nations because of its unique natural resources. The park encompasses over 800 square miles in the Southern Appalachian Mountains and is divided between Tennessee and North Carolina. It is world renowned for its biological diversity and animal life. Over 17,000 species have been documented in the park and scientists believe an additional 30,000-80,000 species may live there. The Great Smoky Mountains are America's most visited national park and are among the oldest mountains in the world -- they formed 200-300 million years ago. The unique habitat is home to an estimated 1,500 bears and 100 species of native trees. There are more than 800-miles of hiking trails. The Park Service maintains 10 developed campgrounds in Great Smoky Mountains National Park. Dump stations are located at Cades Cove, Cosby, Deep Creek, Look Rock, and Smokemont campgrounds. Yellowstone National Park is America's first national park. The park was established in 1872 and spans three states: Wyoming, Montana and Idaho. Yellowstone is a spectacular for wildlife, geology and nature, and is most famous for its geothermal activity. Yellowstone National Park holds the planet's most diverse and intact collection of geysers, hot springs, mudpots, and fumaroles -- the most famous collection of geysers are found at Old Faithful. There are more than 300 geysers in Yellowstone National Park. The wildlife and plants at Yellowstone are almost as famous and diverse as its geysers. The park is home to grizzly bears, elk, bison, and wolves; and more than 1,350 species of vascular plants live in Yellowstone, 218 are non-native. Park visitors love hiking, camping, fishing and the sights at the Grand Canyon of Yellowstone. There are 12 campgrounds in Yellowstone National Park with more than 2,000 campsites. Yosemite National Park is known for its waterfalls and granite walls. Yosemite Falls is the biggest in North America with three drops totaling 2,425-feet -- the seventh highest in the world. California's sweetheart, Yosemite spans 1,200 square miles in the Sierra Nevada. Yosemite Valley is home to meadows, wildflowers and El Capitan, a prominent granite wall that rises from the valley and is one of the most famous rock climbing destinations in the world. Half Dome, a popular climbing and hiking destination and a California landmark also resides in Yosmeite National Park. Two Wild and Scenic Rivers, the Tuolumne and Merced rivers, begin in the Yosemite high country and flow west to California's Central Valley. Visitors can experience the park from 800 miles of hiking trails and 282 miles of road. Yosemite has 13 campgrounds, of which 10 campgrounds can accommodate RVs and 4 are open year-round. Group campsites and horse sites are also available.